“Progressive Rock,” and “Concept Albums,” have a rich heritage, blending themed music, stretching out the score stylistically beyond the chorus / verse tradition, and incorporated elements of the avant garde, jazz, rock, and classical music. Progressive Rock flowered out of the psychedelic sounds created in the 1960’s, yet it was also a reaction to this same music … and probably the very best of this genre was created by Caravan, who built on the early works done by Pink Floyd, Yes, and King Crimson, who’s albums seemed to be a series of songs strung together, while the songs of Caravan actually seemed to flow in and out of each other. The music of “In The Land Of Gray And Pink” is spectacular in its essence, rich with texture, intimate, with swirling melodic melodies of fantasy, which were going to inspire so many in the future. There is no urgency to the music found here, it simply flows over you, engulfs you … the keyboards are unlike anything I had heard before, and when those are mixed with outstanding lyrics, a more then creative bass line, and a crisp clean drum, we were presented with something so totally new, so very tight, something that was nothing short of sublime. 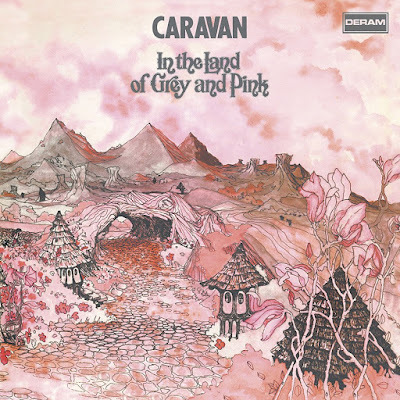 Unlike the other progressive bands of the day, on this release, Caravan did not feature the guitar as the be all and end all of musical instruments. Here, the guitar took its place, incorporated into the structure of the concept, rather then leading the concept … and it was all brilliantly done. Sure, it’s been well over thirty five years since this album was first laid on my turntable, and yes, “In The Land Of Gray And Pink” has taken its place in the time line of my musical collection … but for the sheer grace and eloquence, there has been little to equal it in all of those years. This is one of those albums I wish that I could hear for the first time all over again. Nice to see a review of the album here. It's no "Led Zeppelin IV" but it's a fine and interesting album. man does that bring back days, I thought I was the only one who liked this group. After putting together a good audio system while stationed in Germany mid seventies this was one of my favorite.